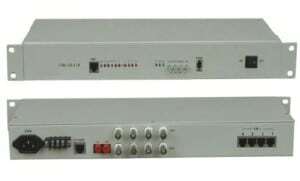 AN-FM-600 series SNMP managed, LCD console equipped, carrier class 1+1 double 155 Mbit/s fiber multiplexer with modular service cards approach: n x E1, n x V.35, n x RS-232, n x FXS/FXO etc. 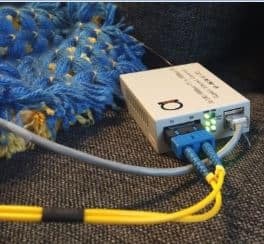 2 x 10/100 Ethernet already on board, no need separate plug in modules! SNMP managed, LCD console equipped, carrier class double 155 Mbit/s fiber multiplexer with modular service cards approach: n x E1, n x V.35. n x Ethernet at your choice. Modular integrated transmission optical fiber multiplexer is created with optical path interoperability, flexible structure and modular design. Its function modules are independent of each other but easy for assembly, which enables it to derive a series of optical multiplexer products with multi-service interfaces. The equipment is furnished with four modular slots. According to the networking requirements of different users, various kinds of interface modules can be employed. Users can also add or replace interface modules to accommodate to the requirements of different application environments to protect their existing investment. Meantime, the equipment allows users to activate expandable interfaces to adjust the scale of network interfaces based on business growth, so as to help realize real-time follow up of network to business.